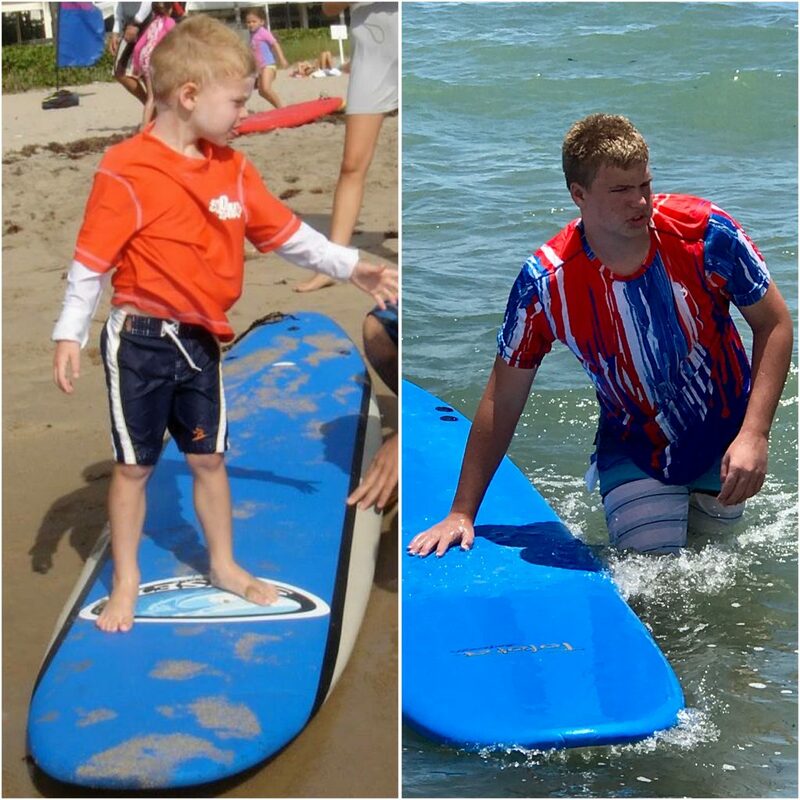 Nothing screams ENDLESS summer more than raising a child with autism. All you need are some tasty waves, a cool buzz, and you’re fine, they say? Not so fast, brah. Fourteen years into this, I can honestly say I still feel like a junkyard dog in a town of Gidgets, grom moms, and brilliant toe-headed Spicolis. You may as well brand “Benny” straight across my forehead. Hey, at least it’s a tan forehead. Seriously, praying your manchild doesn’t Hang Eleven daily (go ahead, look it up) is a “shore thing” in my world. Sigh. It doesn’t help my beautiful Jan-Michael Vincent of a son looks as if he’s ready to tackle Mavericks. And guess what? The gentle giant wants to go to surf camp. I can’t say no. Nor can I get the tune of “Wipeout” out of my head. I have always believed, correctly, I am the weakest link when it comes to allowing J.R. to bail from his board and experience this swell life. Hang Loose? What’s that? Yet I know the more I cry “TSUNAMI!” the flatter his ocean. Waves are fueled by wind, and offshore storms generate these winds to cause ripples. I must be that wind. Will my fear of exhaling create the dreaded small chop for my J.R.? Or do I blow out all of my fears, throw my cautions you know where, and provide the ground swell he so deserves? After all, “local” weather conditions determine a wave’s true quality. Surf camp it is. As J.R. and I showed up to our first day of dawn patrol, it took all I had not to turn to him and say “Dude, this is gnarly.” Let’s just say it took a Local or two to set this kook at ease. As I left camp drop off to drown my sorrows in the nearest rip current, I took a minute to take in the view. I was in awe of the ocean’s raw beauty. It was then I realized the water does not discriminate. It cares little of who you are and even less of your skill set. The Atlantic is ignorant to J.R.’s abilities so he therefore has the same chance as any to get to yell out “Cowabunga,” followed by a good licking. Autism who? I refused to bury my head in the sand, mostly because it’s wicked hot. My reward? J.R. has thrived. Shredded, actually. As an added bonus, I learned what it meant to be a part of a surfing “community.” It’s a place where everyone tries to learn your name, safety is held in high regard, and giving back is everything. What could be better? Thanks to hanging ten, and the four plus pros who joined me in giving autism the finger this week, J.R.’s fourteenth birthday is adding up to be an epic one. And when in doubt, moms, let ’em paddle out.